No-IP now has a new account management system. my.noip.com has replaced Members for all Free and Enhanced customers, and other services are quickly following. The new system is more streamlined, giving you easier access to hostnames, account information and other settings. We now offer a dashboard which provides related dates for your No-IP account, allows you to quickly see how many hostnames you have created and also allows you to create additional hostnames. On the left hand side, you will see our new navigation menu. Currently Free and Enhanced users will be using the Dynamic DNS tab on the left. This will allow you to create, modify and remove your hostnames. We also have introduced AAAA (IPv6) records for Free and Enhanced users, which can be added when you create or modify a hostname. At this time, we do not support dynamic updates for AAAA records, but will be doing so in the near future. Dynamic DNS also has a group tab which is similar to our group feature on our member’s system but is more accessible and user-friendly. The new system also supports timezones. You can set your account timezone by going to Account on the left, then select the Account Settings tab, then Select the Timezone you would like to use. My services will show you the services you currently have with No-IP. If you need to modify or make changes to your SSL Certificates, Domain Registration, Email or any of our other services apart from Enhanced and Free Dynamic DNS you will need to return to Members. Find out how to create a hostname using the new my.noip in our latest Youtube video. Have other questions? Visit the My No-IP section of our Knowledge Base to learn answers to common questions and step-by-step guides. I would like to reestablish my no-ip account, but my cameras stop running about a 9 months before my subscription expired. I need to find out what would be the steps required to my home security camera running again! 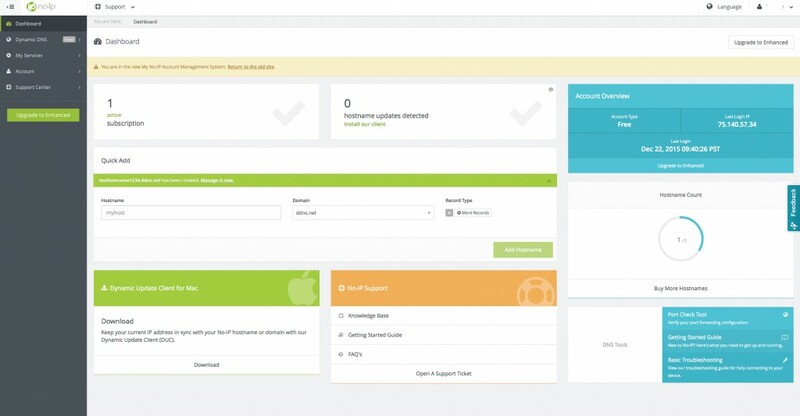 Please submit a support ticket at http://www.noip.com/ticket and our support team will be more than happy to get your service working again.